This extremely popular Ed Dubois designed and Westerly Marine built 32ft Cruising yacht is equipped to a very good standard with a full sail wardrobe and ready to go cruising. 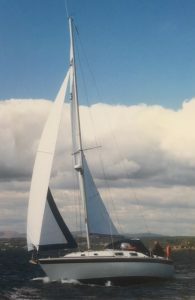 The Westerly Fulmar 32 is a popular family cruiser configured with twin bilge keels making it ideal for cruising on the Forth or similar areas. It has an excellent reputation for its sailing ability / performance and offers plenty of space to cruise in comfort. The vessel includes a Volvo Penta 2002 18Hp diesel engine, inflatable tender and outboard engine, Flavel Vanessa 2 burner grill & oven, Furuni 1623 radar, ICOM VHF with remote handset, Navico TP300 Tillerpilot, Lowrance Chartplotter 3500, depth and speed instrumentation. With sprayhood, boom cover and lazy jacks,single line reefing, Plastimo windlass and 25lb CQR anchor and 5/16 in. chain, various fenders, horseshoe lifebelt, spare anchor, boarding ladder and a pair of 110 amp batteries. Standing rigging professionally replaced in 2014. For full specification and additional photos please do not hesitate to contact us.